How do the motor start capacitor work? 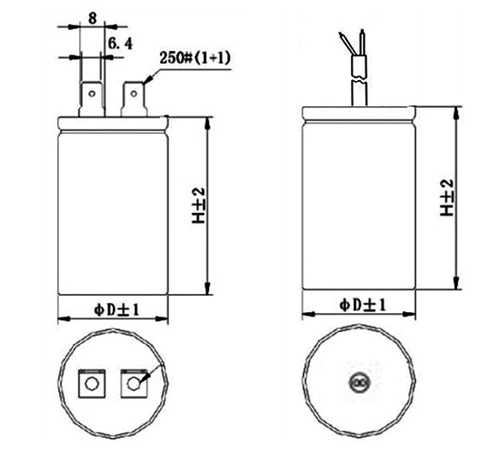 A start capacitor is used to briefly shift phase on a start winding in a single phase electric motor to create an increase increase in torque. Start capacitors possess a very large capacitance value for their size and voltage rating, and as a result, are only intended for intermittent duty. It is because of this that start capacitors fail after being left energized too long due to a faulty starting circuit on a motor. Why my Motor start capacitor have a resistor? Most replacement start capacitors will not include a resistor. You can check the condition of the old one by checking the resistance value, or just replace it with a new one. This should read somewhere around 10-20k Ohms and around 2 watts. The resistors are usually either soldered or crimped to the terminals. The purpose of the resistor is to bleed off residual voltage in the capacitor after it has been disconnected from the circuit after start up of the motor. Not all start capacitors will use one, as there are other ways to accomplish this. The important thing to note is that if your original capacitor had one, you’ll need to replace it on the new capacitor. It can be used in the startup of single-phase Ac motors (50Hz or 60Hz) to gain greater angular force under lower stating current. It is characterized by its excellent electric property, stable and dependable quality. Alternation 0.5-4 minute turn on 1 time for second, 12500~50000 times.